Download this reportPrint friendly pdf format (0.81mb). Now that the Federal Reserve is committed to some form of tapering, we believe that asset allocation within the fixed income arena becomes even more significant. In particular, today’s low rate environment likely means that allocators of capital will need to become more opportunistic in their approach to earn some of the yield required to meet their targeted hurdle rates. Probably more important, though, is that investors may also need to allocate outside of traditional fixed income to include more equities and alternatives to be successful on a long-term basis. 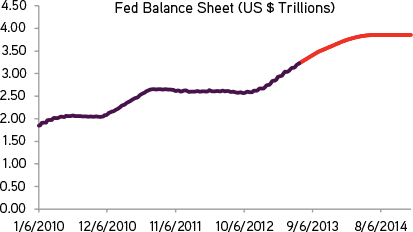 While there is no exact answer to the current Fed Chairman’s question,1 we do know that the Federal Reserve will likely have placed an estimated $4 trillion on its balance sheet by mid-2014 when it initially begins to consider any downsizing of its asset base. So in terms of what one would “pay” to avoid a second Depression, we believe that $4 trillion is at least a good place to start. Data as at June 30, 2013. Source: U.S. Treasury, Federal Reserve, ISI Group. But in the investment business, marginal change often matters most, and Ben Bernanke first made it clear during his June 2013 press conference comments that the Federal Reserve is now committed to some form of tapering of its purchases in the not-too-distant future. Not surprisingly, the Fed’s recent commentary surrounding tapering—and the potential for better growth as shown by our proprietary models in Exhibits 3 and 4—has many in the investment community rethinking their current asset allocation frameworks, fixed income allocations in particular. 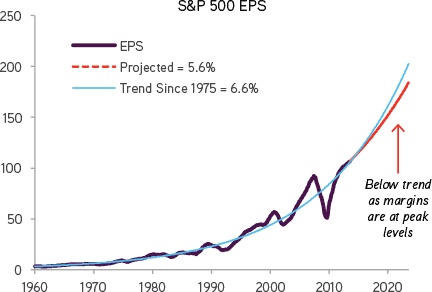 The Earnings Growth Leading Indicator (EGLI) is a statistical synthesis of seven important leading indicators to S&P 500 Earnings Per Share. Henry McVey and team developed the model in early 2006. A = actual; E = estimated. Data as at July 10, 2013. Source: KKR Global Macro and Asset Allocation analysis, Bloomberg. Our view, which we initially outlined at the beginning of the year in our Outlook for 2013: A Changing Playbook, is largely unchanged. Specifically, given where interest rates are located as well as where we are in the economic cycle, we believe that 2013 is the time to significantly underweight government bonds. So as we show in Exhibit 5, government bonds still represent the largest single underweight in our target asset allocation at negative 1700 basis points, while high grade debt also remains a significant underweight for us at negative 500 basis points. Strategy benchmark is the typical allocation of a large US pension plan. Please visit www.KKRinsights.com to review our Outlook for 2013: A Changing Playbook note, which further reviews these ideas. Data as at September 9, 2013. 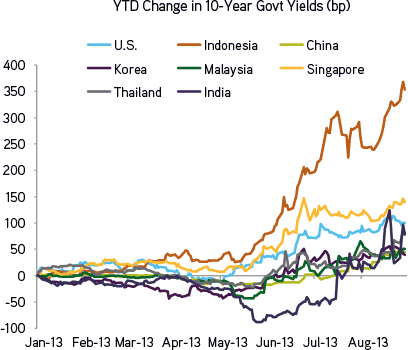 Source: KKR Global Macro and Asset Allocation (GMAA) analysis. We retain our 17% underweight to government bonds and a 5% underweight to high grade bonds. In theory, risk-free government bonds and high grade corporates should deliver yield and act as a shock absorber, particularly during periods of market duress. Given the starting point today however, we believe government bonds and high grade debt can do neither. If there is good news in this area, it is that the recent back up in yields now puts government bonds of the 5-10 year maturity closer to near-term fair value, in our estimation. As we describe below in substantial detail, we think that monetary policy – even after the upcoming tightening cycle – will still be extremely accommodative relative to past cycles. We are lowering our emerging market (EM) debt allocation to 2% from 5%. Given tapering in the U.S. and the growing deficits in places like Brazil and Indonesia, we believe that this asset class will face some important cyclical challenges for at least the next 12-24 months. In our view, these challenges are likely to occur after 15 consecutive quarters of positive flows and a nearly 300% increase in EM bond fund assets under management for emerging market debt (EMD). In addition, our belief of late has been influenced by some of the fiscal sloppiness that we see on the ground in many of the big bond issuing EM countries that we have visited recently. Finally, we believe recent substantial currency depreciation in places like Indonesia, India, and Brazil may unfortunately soon lead to more “pass through” inflation in the coming quarters. By comparison, we have increased our high yield allocation back to 5% from 2% percent. There is no change to our 2% bank loan allocation. After reducing our allocation to this asset class by 3% in January, we are now adding it back. Key to our belief is that recent dislocation in the dollar-based high yield market is an opportunity. 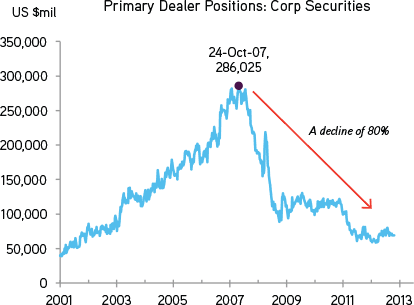 In particular, the current market’s implied default rate of approximately 4.9% appears too high to us (Exhibit 23). Further strengthening our view is our economic forecast, as we believe the current recovery still has ample room to run. Separately, we continue to prefer a 2% bank loan allocation versus a benchmark weighting of zero because we like the floating rate nature of this product. We continue to target a 3% position in private credit and a 5% position in mezzanine debt for two primary reasons. While the private credit markets are not as large or liquid a market as high grade or government bonds, we believe they represent somewhat of a “must have” allocation at this point in the cycle for two reasons. First, we believe the current illiquidity premium appears outsized, allowing investors to pick up a substantial yield boost without having to take a lot of duration risk. Second, our call for a long duration economic cycle with periods of outsized government-induced market volatility could provide private credit lenders with an opportunity to capture attractive yields during the inevitable periods of market dislocation. Overall, given the starting point on bond yields, we believe investing in a low return world requires longer time horizons, more flexibility and often less reliance on traditional fixed income asset classes. As we detail below, we are increasingly bullish on an opportunistic approach to fixed income that allows managers with patient capital the flexibility to maneuver among asset classes to enhance yield, garner some additional diversification, and minimize volatility. Probably more important, though, is that we believe that leading allocators of capital, particularly pension funds, are going to have to think beyond traditional fixed income towards more equities and alternative structures if they intend to exceed their prescribed hurdle rates. In the following sections we drill down on our asset allocation views in global fixed income. 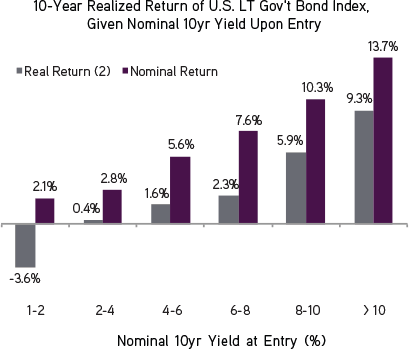 As we have reflected in our asset allocation targets since arriving at KKR in 2011, we believe there really is just not much merit to government bonds in one’s portfolio at this point in the economic and interest rate cycles. Underpinning our thesis are the following considerations. First, at the risk of being labeled a “Master of the Obvious,” we just want to reiterate that the starting yield is now so low that the coupon can’t be of much help in an income or total return strategy. In many instances, for example, moderate duration government bond yields and high grade coupons are now just one third the annual return bogey many pensions and endowments face. Second, the starting price is so high that it gives government bonds limited ability to serve their traditional role as a shock absorber in one’s portfolio. As one can see in Exhibit 7, financial history tends to support our restrained viewpoint towards these conservative fixed income asset classes, government bonds in particular, on both a real and nominal basis. 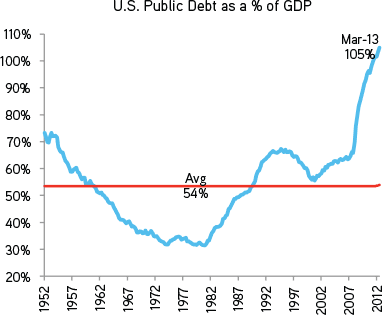 Further strengthening our view is that government bonds are no longer as risk-free as in the past as debt as a percentage of GDP has increased meaningfully in recent years. Indeed, one can see in Exhibit 8 how much government debt has ballooned of late. Observation Period = Dec-1927 to Apr-2013. (1) “Long-Term Government Bond Index” = Treasury bond returns from Aswath Damodaran at NYU Stern based on data from the Federal Reserve database in St. Louis (FRED) from Jan-1928 to Dec-1972, Barclays U.S. Government: Long Total Return Index Value Unhedged USD from Jan-1973 to July-2003. 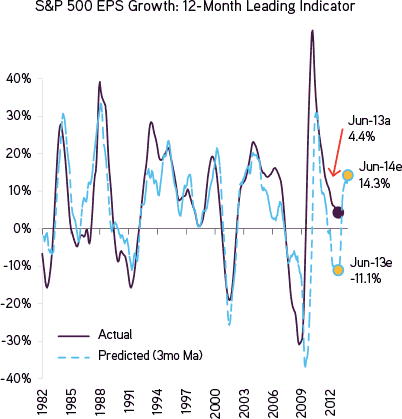 (2) Real returns are deflated by U.S. CPI. Data as at July 31, 2013. Source: Stern, Barclays, Bloomberg. Data as at July 5, 2013. Source: Bureau of Economic Analysis. However, while we are in the camp that interest rates have structurally bottomed and are headed higher, we do not believe we are on the verge of a 1994 bond market debacle. Key to our belief is that the Fed likely intends to move slowly, as inflation is low and growth is more moderate. In fact, we believe there is increased potential that a lot of the near-term sell-off in rates is now complete. Drafting off some work done by my colleague Dave McNellis, our base case remains that the current theoretical level for the 10-year government rate should be at or around 2.75%, which is actually about where current 10-year yield in the U.S. is now trading. One can see our fixed income forecasts in Exhibit 9. Probably more important though, is that this exhibit shows our December 2014 forecast is up to 3.23%, while our 3-year forecast for December 2016 is only up to 3.43%. What’s different this time, in our view, is that the economy is deleveraging and the population is aging, both of which are expected to influence the trajectory of rates in the out years. One can see the details of our Fed forecast below. 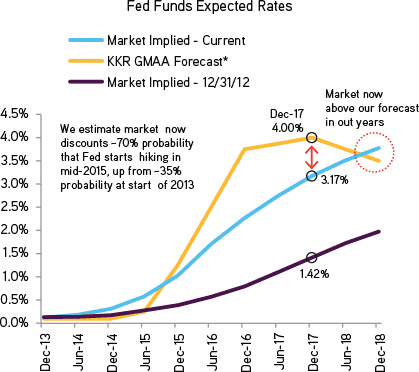 Market Implied Fed Funds forecast as per Fed Funds interest rate futures through June 2015. Thereafter, as per Eurodollar interest rate futures, assuming a constant 35bp discount to the expected Eurodollar rate. Data as at August 1, 2013. 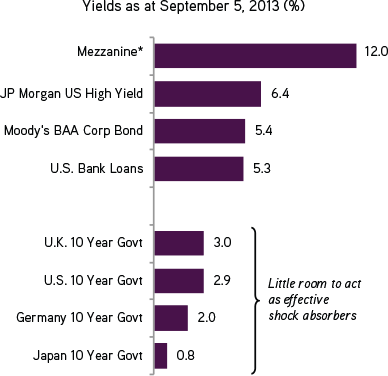 Source: Bloomberg, KKR Global Macro and Asset Allocation analysis. However, as we show in Exhibit 10, we believe the Fed will raise rates more this cycle than in a traditional cycle, but this view is only because the starting point is so low. In fact, our assumptions are relatively dovish in terms of where we expect rates to end up both relative to inflation and GDP. As we show in Exhibit 10, we actually expect real rates (Fed funds rate – CPI y/y) to peak around 1.2%, which is well below the historical average of 3.8%, and nominal rates to peak fully 160bp below nominal GDP, which is well below the average of just 10bp below nominal GDP3. So our bottom line is that while we see rates moving up on a structural basis, we believe rates can remain low relative to fundamentals because we believe balance sheet deleveraging and an aging population will make the U.S. economy relatively vulnerable to Fed hikes. Data as at August 1, 2013. Source: Bureau of Economic Analysis, Bureau of Labor Statistics, Haver Analytics, KKR Global Macro and Asset Allocation analysis. Interestingly with the recent back up in both real and nominal rates, the market has actually gotten more pessimistic than our forecasts in some instances. For example, as one can see in Exhibit 9, we forecast 10-year real yields to reach 84 basis points in three years. But the market has already moved beyond this, boosting real rate expectations to 1.32% in three years. Meanwhile, on a nominal basis, the market forecast for December 2016 is 3.82%, nearly 40 basis points higher than our forecast. As such, we view the steep sell-off in these parts of the market as somewhat excessive at this point. Data as at August 12, 2013. Source: Bloomberg. Data as at August 1, 2013. Source: Bloomberg, Haver Analytics, KKR Global Macro and Asset Allocation analysis. By comparison, we believe that investor expectations surrounding the shorter part of the curve are still too conservative. To this end, we have updated an important chart from our 2013 Outlook: A Changing Playbook. See Exhibit 12 for details, but what it shows is that, while Fed Funds expectations have actually exceeded our projections beyond June 2017, there still appears to be an adjustment required in the shorter duration part of the curve. Regardless of whether we are right about predicting the near-term gyrations in rates along the yield curve, we do not want to blur what we believe to be our bigger-picture, high conviction conclusion: the traditional roles of government bonds as a shock absorber and an income producer in almost any asset allocation framework should be rethought. Further exacerbating our point is that low yields and high prices are occurring at a time when government debt to GDP is hitting record high levels. As we mentioned earlier, we too have reservations about traditional investment grade debt, particularly given the overall low level of yield on many of these securities. As such, we continue to maintain a 1700 basis point and a 500 basis point underweight, respectively, to these two asset classes because we feel strongly that there are much more attractive alternatives both inside and outside of the traditional fixed income arena for investors to consider at this point in the cycle. We are reducing our allocation to emerging market debt to two percent from five percent. While we still like aspects of the asset class on a long-term basis, several things have changed in our mind. For starters, EM debt tends to do less well when the Federal Reserve is draining liquidity from the system. To be sure, we do not see the Fed raising rates anytime soon, but we do believe that tapering is the QE (quantitative easing) equivalent of what a traditional rate hike used to mean during normal interest rate cycles. This view is not to be underestimated, as one can already see the influence across the emerging markets (both debt and equity) of the Federal Reserve in Exhibits 13 and 14. EM Equities = MSCI Daily TR Gross Emerging Markets EM Local (GDLEEGF Index), DM equities = MSCI Daily TR Gross World Local (GDDLWI Index). Data as at August 29, 2013. Source: Bloomberg, MSCI. Data as at August 29, 2013. Source: Bloomberg. Second, given the increasing deficits that countries like Brazil, India and Indonesia now have, we believe that QE may have overstated the absolute credit worthiness of the sovereign bonds in these countries. 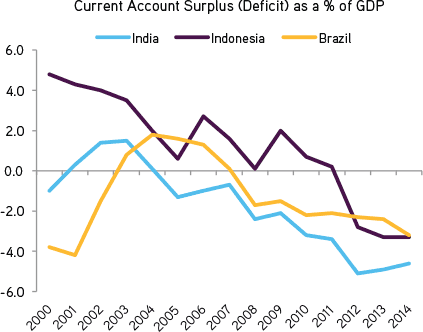 Using Indonesia as an example, we note that it now runs both a current account and fiscal deficit, and we believe there is likely more to come. Moreover, we expect increased inflation pressures in Indonesia as the country is now being forced to reduce its sizeable fuel subsidy (3.7% of GDP) during a period of slowing growth4. Importantly, degradation in these countries’ finances is occurring at a time when, as we show in Exhibit 15, absolute rates are just extraordinarily low, particularly relative to recent history. GDP-weighted composite of Brazil, Russia, India, Mexico, Indonesia, Turkey, Poland, South Africa, Colombia, Thailand, Malaysia, Philippines, Peru and Vietnam. Inflation measured as the rolling year-ahead CPI forecast as per the IMF World Economic Outlook. Data as of June 30, 2013. Source: Haver Analytics, IMF WEO. Data as at April 15, 2013. Source: IMF WEO. So, to help investors better understand the profiles of various EM countries, we created a database to track investment flows into EM markets. See Exhibit 17 for details, but our basic premise is that as rates rise in the U.S. and other developed markets, EM becomes a less compelling fixed income destination on a relative basis. As a result, investment inflows may begin to diminish. Countries with large current account deficits, particularly those funded via volatile portfolio flows (i.e., securities purchases), would be particularly vulnerable to economic shocks. The table below screens for such situations and focuses in particular on countries that a) lack the reserve coverage to defend against a drought of foreign flows and b) have relatively unattractive balance sheet and growth profiles, rendering them especially vulnerable to foreign buyers’ strikes. Pulling it all together, we believe South Africa, India, Brazil and Turkey look the most vulnerable to rising global rates, while surplus countries with high reserves such as Saudi Arabia, China, Chile, South Korea and the Philippines seem least vulnerable. Data as at June 17, 2013. Source: World Bank, IMF, Bank for International Settlements, respective national statistical agencies, Bloomberg, Haver Analytics. Third is that recent currency tailwinds are already transitioning into currency headwinds, particularly as the Fed becomes less accommodative. We believe this statement is not to be taken lightly as currencies have represented a significant amount of the total return in many emerging market debt stories in recent years. Indeed, as Exhibit 18 shows, the currency tailwind has been positive in eight of the last twelve years. Moreover, because of recent depreciation in local currencies versus the U.S. dollar, we believe many of the larger EM countries are now likely to experience to some form of “pass-through” inflation as the prices of imports become more expensive. Currency Impact = (JPMorgan GBI-EM Global Composite Unhedged USD - JPMorgan GBI-EM Global Composite LOC) / JPMorgan GBI-EM Global Composite Unhedged USD. Data as at July 31, 2013. Source: JPM, Bloomberg. 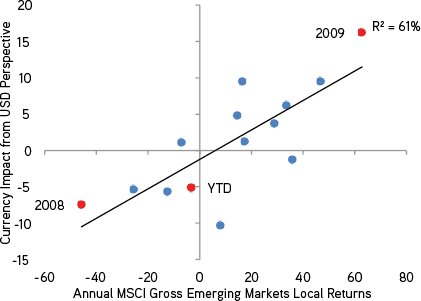 Currency Impact = (MSCI EM Gross USD Returns - MSCI EM Gross Local Returns) / MSCI EM Gross USD Returns. Data as at July 31, 2013. Source: MSCI, Bloomberg. Finally, if mean reversion still means anything in the investment world, then we believe flows could likely go the other way in EM for some time. 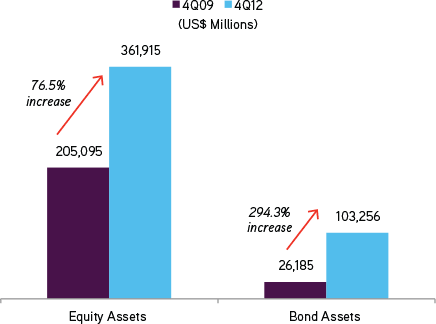 All told, EM bond fund assets increased a full four-fold to $103 billion in 2012 from $26 billion in 2009 (Exhibit 21). How good has it been? 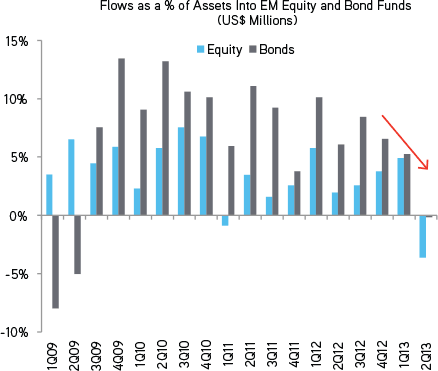 2Q2013 marked the first quarter of outflows from bond funds after 15 consecutive quarters of strong inflows. To be sure, we are not structurally bearish on the asset class, but we believe that some of the recent outperformance should dissipate, particularly as the Fed starts to taper. Data as at July 12, 2013. Source: Simfund, Lipper, Goldman Sachs Research. Within emerging markets fixed income, we still target a combination of both corporate debt and sovereign debt. However, we would be more selective when it comes to buying local currency debt at this point in the cycle. 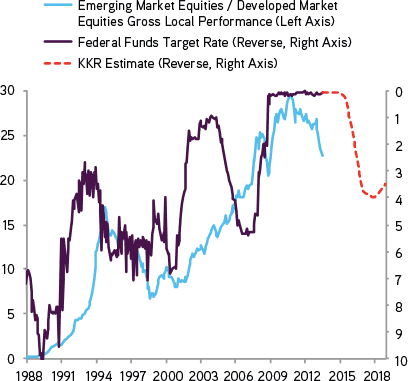 Indeed, with the Fed now beginning to swing into action and many developing countries being less disciplined, we believe dollar denominated EM debt is likely to outperform its local brethren. With the recent back up in rates and widening of credit spreads, we are adding back a three percent position to liquid high yield, raising our allocation to five percent from two percent, which is in line with the benchmark allocation. Separately, there is no change to our 2% allocation to bank loans, our 3% allocation to direct lending, and our 5% position to mezzanine debt. First, we believe folks are now too pessimistic on implied corporate default rates. As we show in Exhibit 23, the current implied default premium is around 4.9% versus a historical rate of 4.0% throughout the cycle. Moreover, if we use the 2007-2011 Great Recession period as a proxy (which was a pretty tough time in the economic cycle), credit losses on high yield bonds actually only averaged about 3% per year. So even if we assume a credit cycle on the magnitude of 2007-2011 lies ahead of us, junk bonds seem priced to deliver roughly 175-200 basis points excess return over Treasuries. Second, we believe that we are still in the early to middle stages of the cyclical part of this economic recovery, including housing, autos, energy and manufacturing. In fact, we are just four years into an economic expansion; by comparison peaks in defaults have typically been 8-10 years apart (e.g., 1991, 2001, 2009), so there appears to be somewhat of a disconnect5. Third, while leverage levels have admittedly begun to grow, they actually remain well below the peak levels of prior credit cycles. 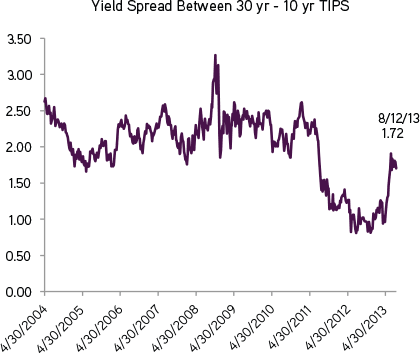 Maybe even more important, spreads remain reasonably wide relative to leverage levels. In fact the current level of spread per unit of leverage, at 123 basis points, is still above where it was many times during the 1990s and 2000s, including a trough of 87 basis points in 20076. Fourth, supply of spread products is still shrinking on a net basis, which means the bid for many parts of the liquid spicy spectrum may remain more robust than many folks currently think. According to some interesting work done by the investment bank JP Morgan7, net issuance across spread products is actually supposed to decline $116 billion in 2013e. By comparison, net issuance increased a full $1.5 trillion in 2007. And if one considers the estimated $725 billion of annual coupons that get generated annually from spread products, the demand/supply mismatch appears quite favorable. Fifth—and finally—is that structural deleveraging by Wall Street post the Great Recession has created an attractive illiquidity premium for investors with patient capital. All told, as Exhibit 23 shows, we estimate that the illiquidity premium is now around 4.5%, 1.6x the absolute yield on 10-year treasury yields. In a world of near zero real rates and low nominal rates, the illiquidity premium appears to be a strong vehicle for capturing some measurable step-up in yield, in our view. So, given our outlook, we believe that the current macro backdrop may create an opportunity for fixed income investors who have the capacity and staying power to invest with a long-term focus during the inevitable volatility that typically coincides with both government and financial services deleveraging. No doubt, there will be bumps and dislocations along the way in the “spicier” part of the liquid credit markets, but we believe the risk/reward proposition is actually far stronger today than what can be achieved in traditional safe-haven fixed income assets such as high grade debt and government bonds. 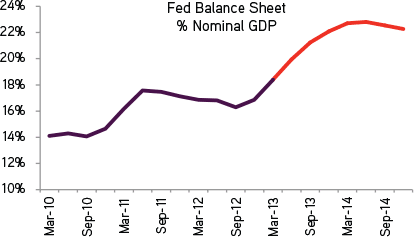 Aggregate of GS, MS, BAC, C, and JPM balance sheets. Data as at May 24, 2013. 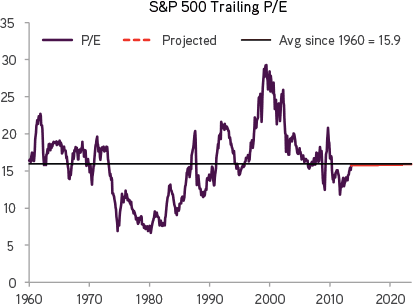 Source: Factset. *KKR Asset Management estimate. Data as at August 9, 2013. 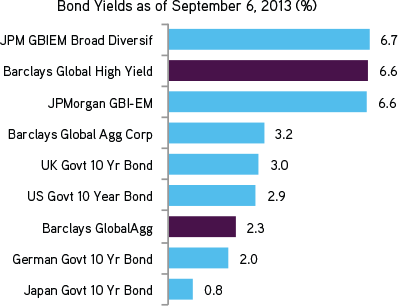 Source: JPM High Yield Bond Index YTW, Bloomberg, KKR Global Macro and Asset Allocation analysis. Meanwhile, our view on the private, or more illiquid side of the credit markets, is largely unchanged. Specifically, because of the sizeable illiquidity premium that has been created, private lending returns in the 7-10% range may still be possible. Meanwhile, within the mezzanine market, yields are still in the 12% or so range, depending on the credit. One can see that in Exhibit 24. * KKR Global Macro and Asset Allocation estimated. Data as at September 5, 2013. Source: Factset, Bloomberg, KKR Global Macro and Asset Allocation team. Source: S&P LSTA, BofA-ML HY Index, Public Company Filings of Ares Capital Corporation. 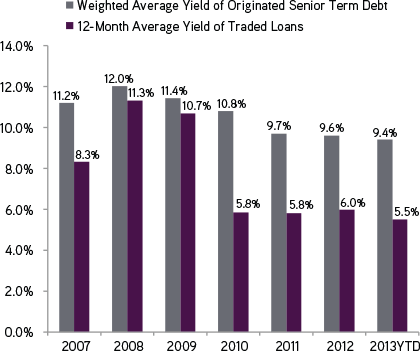 Weighted average yields of senior term debt and senior subordinated debt. S&P LSTA and BofA-ML HY Index as of June 30, 2013. Ares Capital as of March 31, 2013. Where could we be wrong? We could be wrong in our view that rates are—in fact—now approaching fair value. However, as we showed above, we believe the big near-term shock in interest rates for 2013 has already occurred. Or we could be too constructive on the duration and magnitude of the economic recovery. However, we see energy, housing, autos and manufacturing in the U.S. all recovering, and our recent trip to Europe makes us feel better, not worse about the situation the Continent. So our bottom line: in a world where 1) pension funds, endowments, and Baby Boomers all need solid income streams to hit their respective return hurdles and 2) we have confidence in the duration of the economic cycle, we believe an outsized allocation to spicy credit makes sense. In particular, liquid investments such as high yield as well as more illiquid investments like private lending and mezzanine financing still appear attractive to us in a low inflation environment, particularly if the underwriting selection is done properly and the duration is not outsized. Asset Allocation Thoughts: Bonds Plus What? While we have made some important tactical changes within the fixed income arena, the bigger strategic question is whether many folks, traditional pension funds in particular, are just too exposed to fixed income as an asset class in a world of 7-8% hurdle rates and puny government bond yields. 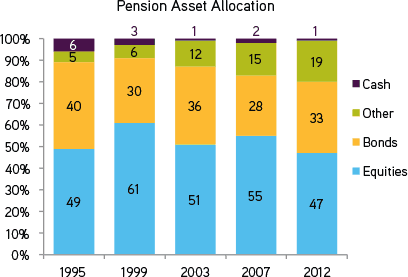 All told, according to a recent survey by Towers Watson, the average pension fund still has 30-40% of its assets in bonds and 47-61% in equities (Exhibit 26). So if the blended rate on a bond portfolio yields 2-3% as measured by the Barclay’s Global Aggregate index (Exhibit 31) and equities earn their long-term nominal growth rate of around 5-6% with a little multiple expansion (Exhibits 28 and 29), and a dividend yield of 2%, then the “other” bucket is going to need to earn something well north of 10% for the plan to have any reasonable chance of fulfilling its liability structure. Aggregate allocation for U.S., UK, Japan, Australia, Canada, Netherlands and Switzerland. 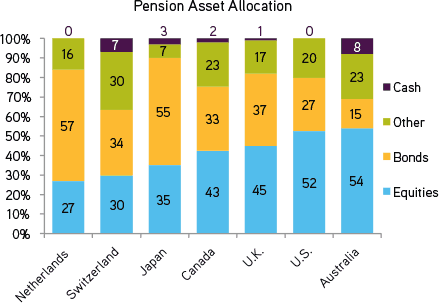 Source: Towers Watson “Global Pension Asset Study 2013” dated January 2013. 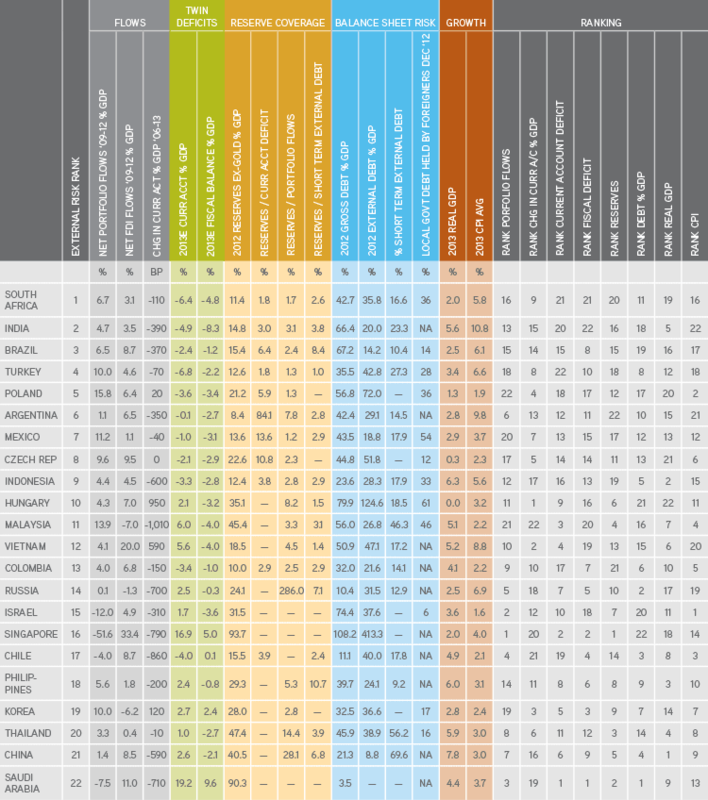 Source: Towers Watson “Global Pension Asset Study 2013” dated January 2013. Data as at July 30, 2013. Source: First Call, Factset, KKR Global Macro and Asset Allocation analysis. Given this view, we believe that both individual and institutional managers should think outside the box when it comes to using asset allocation to meet their investment objectives on a go-forward basis. From our vantage point, there appears to be broadly three out of the box investment approaches for asset allocators to consider: a) more equities/less bonds, b) more opportunistic fixed income and/or c) a broader swath of diversified alternatives. In terms of equities relative to bonds, we believe the argument is fairly straightforward, particularly after nearly three decades of uninterrupted stellar bond performance. 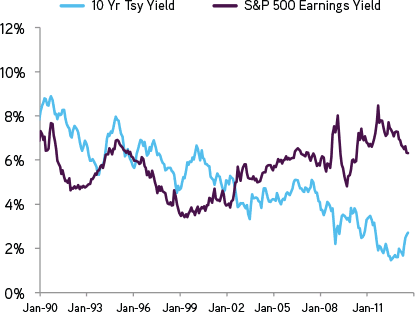 Moreover, if the historical relationship between the earnings yield on stocks and bond yields is still valid (Exhibit 30), asset allocation frameworks should be tilted much more heavily towards equities versus bonds at this point in the capital markets cycle. Data as at July 30, 2013. 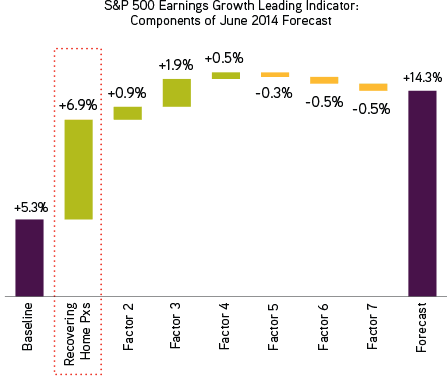 Source: Bloomberg, Factset, Thomson Financial, S&P. Data as at September 6, 2013. Source: Bloomberg. Within equities however, formulating a regional view on where to allocate seems more complicated. Indeed, Exhibit 32 presents some interesting conclusions for investors to ponder. 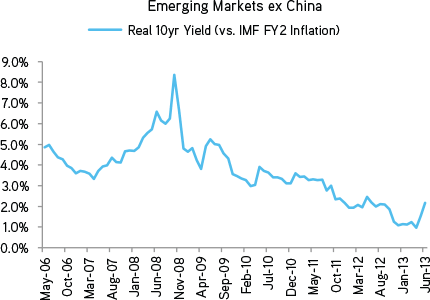 Specifically, despite all the growth, EM equities have performed poorly as of late. However, given the large representation of state-run companies in many public indexes, our belief is that large, more generic EM equities are likely to continue to underperform (Exhibit 32). By comparison, in our target allocation that we set in January 2013 (Exhibit 6), we added to Japan and Southeast Asia (hence the overweight to Asia), and we have reduced our underweight to Europe. Based on monthly gross local returns from Jan 1988 to Jun 2013. First available data across all above listed markets was Dec 1987. Data as at June 30, 2013. Source: MSCI, Bloomberg. Another potential option is a more opportunistic approach to fixed income, particularly in the credit arena. As many forward-thinking endowments and pensions are now doing, there is a growing trend towards giving fixed income managers more flexibility to toggle between asset classes as they come in and out of favor. Given our view on where we are in the deleveraging cycle and the inherent volatility that traditional government deleveraging typically creates (Exhibit 33), we believe this strategy makes a lot of sense. 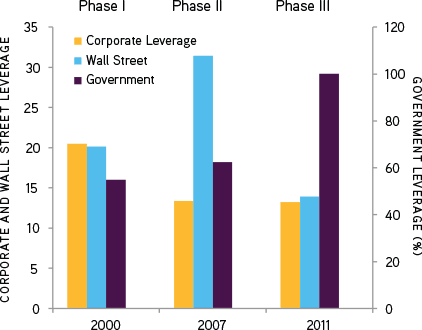 Corporate Leverage = S&P 500 ex-Financials Net Debt-as-a-%-of-Assets; Wall Street Leverage = Average Assets-to-Equity for Goldman Sachs and Morgan Stanley; Government Leverage = United States: General Government Gross Debt % of Gross Domestic Product (GDP). Data as at September 30, 2011. Source: IMF WEO, Factset, S&P. 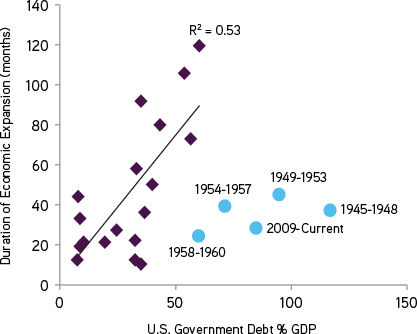 Economic expansions from 1900 to 2011; Debt to Gross Domestic Product (GDP) is at the start of the expansion. Source: National Bureau of Economic Research, Bureau of Economic Analysis, U.S. Treasury, KKR Global Macro and Asset Allocation analysis. Data as at September 30, 2011. Finally, pensions and endowments may also need to consider allocating towards alternative strategies that may be outside traditional liquid stocks and bonds. We believe alternatives can’t—in isolation—solve for what ails an under-funded liability, but as Exhibit 35 shows, returns have been strong across a variety of interest rate cycles. In particular, alternatives like private credit, distressed debt, mezzanine debt and even private equity/energy have delivered double-digit returns in many instances by finding unique opportunities that may not consistently be available in the public markets. By taking a longer-term perspective, an alternative investing format—if done correctly—often allows the manager to institute long-term strategic initiatives that require control of a company or investment versus owning a small passive minority stake in a public company. In addition, there is usually a time arbitrage as the investor is able to take advantage of the illiquidity premium that is not available to strategies where shorter-term decision making is often the result of monthly or even daily liquidity needs. Past performance is no guarantee of future results. 2008/2009 were removed from this analysis due to the extreme volatility and wide range of performance, which skewed results. For more detail on the indexes used, please visit the following websites: www.cambridgeassociates.com, www.lsta.org, www.hedgefundresearch.com, www.lpx-group.com, https://indices.barcap.com, and www.mlindex.ml.com. Data as at 1Q2013 except Cambridge indexes which are through 3Q2012. Source: Bloomberg, Cambridge Associates, KKR Global Macro and Asset Allocation analysis. Past performance is no guarantee of future results. See Exhibit 35 for details. Data as at 1Q2013 except Cambridge indexes which are through 3Q2012. Source: Bloomberg, Cambridge Associates, KKR Global Macro and Asset Allocation analysis. No doubt, there are also some potential drawbacks, including liquidity, higher fees, manager selection and vintage that must always be considered. But in a world of low rates and heightened volatility, we believe—and as we reflect in our target allocations—the current environment is attractive for alternative products that can perform, particularly for those firms that can harness the inherent volatility associated with deleveraging to create excess returns for their clients. While we do not generally make many allocation changes during the year, we do believe that the current environment is a good one to make some modest tweaks within the fixed income arena. 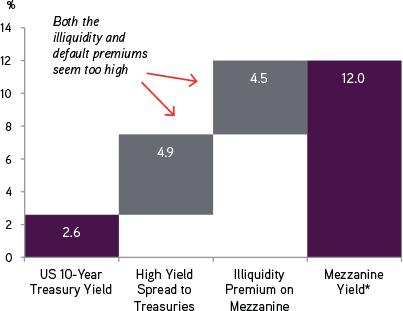 Dislocation creates opportunity, and as we look ahead, we expect U.S. credit spreads in riskier areas like high yield to again tighten as investors come to appreciate that not only is the economy on solid footing but also that the implied default premium looks steep. By comparison, our recent travels to places like Brazil and Indonesia make us feel like rates and credit spreads in emerging markets have been bid in too tightly relative to fundamentals. Separately, we again want to reiterate our strong view that the current structural changes taking place in the Wall Street dealer community are creating some compelling opportunities for investors who can take advantage of the substantial illiquidity premium that now exists in areas such as the direct lending, mezzanine, and the special situations parts of the market. If underwritten properly, the chance to earn high single-digit unlevered returns or better in a 3-4 year time frame relative to what is available in the high grade and government bond markets seems outsized and as such, we view this arbitrage as one of the more compelling areas across the current asset allocation spectrum. Overall though, the most important message we want to deliver is linked to our view that now is the time to rethink one’s approach to asset allocation. In particular, we believe that today’s low rate environment means that asset allocators will need to become more opportunistic in their approach to earn some of the yield required to meet their targeted hurdle rates. Moreover, even if folks are successful in terms of opportunistically allocating within fixed income, in all likelihood many will also need to allocate outside of fixed income to include more equities and alternatives to be successful on a long-term basis. 1	Time Magazine, December 2009 Person of the Year Interview. 2	Press Conference with the Chairman of the FOMC, Ben S. Bernanke, June 19, 2013. 3	Data as at July 31, 2012. Source: Bloomberg. 4	Data as at May 31, 2013. Source: Departemen Keuangan, Biro Pusat Statistik, IMFWEO, Haver Analytics. 5	Data as at July 31, 2013. Source: Haver Analytics. 6	Data as at July 31, 2013. Source: Bloomberg. 7	Data as at July 31, 2013. Source: JPM Credit Research.